In this 32-chapter compilation of short, easy-to-read essays and stories, Yap aims to “correct and debunk certain ideas about feng shui that have built up over the years” and explain away some of the superstitions and taboos. He states from the outset that feng shui is not about quick fixes, and hopes to change the “low” perception some have of this ancient science. What is of great help to readers and young feng shui enthusiasts is that there is at least one illustration on almost every page to help clarify his explanations. Each of the colourful visuals, which include graphics, tables, photos and symbols, presents a lucid account of the message being put across, aside from brightening up the book. We are then introduced to the application of feng shui methods, including the “ Life Gua” which has our year of birth, and thus the animal sign, as reference point, and the paramount importance of not underestimating the power of location. My favourite chapters are on understanding your destiny, changing your life, how the animal signs are “only used as a reference to the 12 earthly branches”, finding the noble man, the significance of water and mountains, and ascertaining whether “dragons are really luckier than other animal signs”. 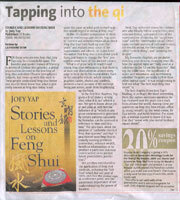 It was enlightening to find out what “ the best kept feng shui secret” is. The last chapter, From Joey Yap’s Mailbag, is perhaps, the most interesting. Here, the author addresses questions he has received over the years via e-mail from around the world. Among them are questions on feng shui love rituals, office qi, wang (wealth) qi, the wind chime, Ba Gua mirror, and toilet humour. For example, a woman wanted to know if it was true that “wood wife plus metal husband equals doom”.